When I awoke around 6:30am on Friday the 19th of September I knew without checking that we had lost. Traffic passed by – no more than usual – an occasional voice echoed along the streets, birds whistled on the roof above the flat. No singing, no shouting, laughing or chanting. By 9am I was on my way out of Glasgow and heading for the west coast for the weekend. Given the events that took place in the city later on that day, I’m glad I stuck to my no vote contingency plan. We can’t dwell on what we’ve lost or what could have been, we have to consider what we are left with, what the United Kingdom is and what that means to us. The joy and exuberance witnessed in George Square in the days before the vote had been usurped by a violent British nationalism. 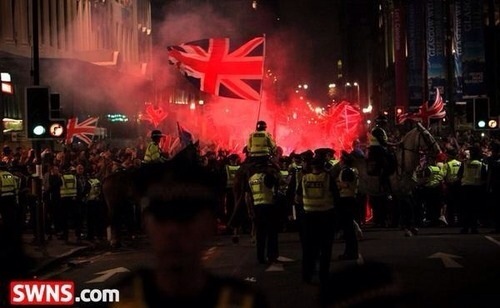 This was no celebration of unity, rather it was a nasty, hate filled exhibition of triumphalism and intolerance dressed in red, white and blue, more akin to the football violence of the eighties than the conclusion of a referendum vote. 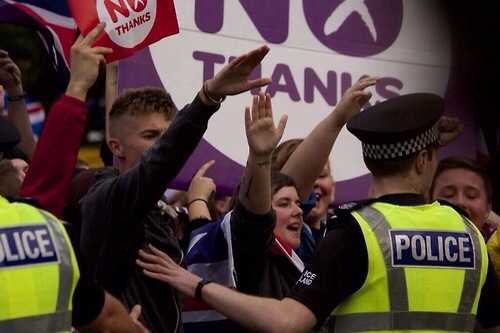 Nazi salutes, taunts and assaults were the order of the day for a gathering organised on Facebook, advertised by Britain First and somehow completely missed by the security services who, we were told, will keep us safe if we stay together. 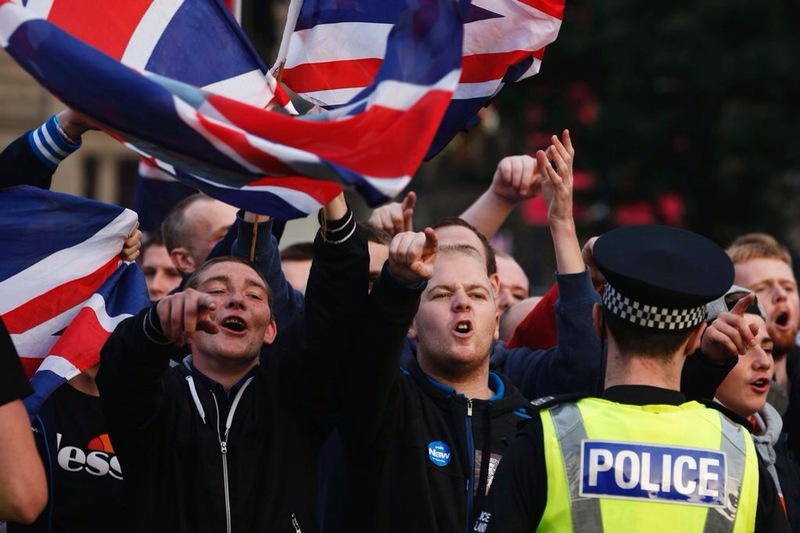 The Union Jack is a flag of convenience for these people; it is their team colours and our national flag is the opposition, even to those who were born and bred in Scotland. Tearing a saltire from a young girl was not a political statement, it was reminiscent of a mindless soccer casual stripping another supporter of their scarf; to attribute a deeper sense of loyalty and belief in nation to such behaviour is insulting. They have no real allegiance to the idea of countries united under one flag but that same union made them what they are. It’s doubtful even in Thatchers most fevered dreams would she imagine a Britain that has lurched so far to the right. To achieve wealth and position through nefarious, unethical or immoral actions is acceptable, to be poor, disadvantaged or vulnerable is tantamount to criminality; the state and the media complicit in fostering the lie. No attempt is made to address divisions in our society because as individuals or small groups we cannot force change. Xenophobia is now a reasonable and supported political ideology, corporate collusion with government raises no eyebrows in the press and fear is the currency of control. It is fear that defines the nature of the United Kingdom today. Fear won the no campaigns victory over independence; fear of loss of earnings, fear of isolation, fear of attack, fear of change and perversely, fear of poverty. Fear of those who seek to do us harm enables successive governments to impose restrictions on ordinary citizens, to change laws and to embark on expensive and ill conceived military ventures. Fear of extremism begets it’s own reactionary extremism; bomb the ragheads, send them back to their own country, vote UKIP. Anger and hatred are the ultimate consequence of a perpetual state of fear. Anger at those we perceive to unjustly have more than us, hatred of minorities and those the press choose to demonise. It leaves a fractured and disparate nation while those at the top reap the benefit of an unfocused population. I want no part of it. Almost half of Scotland rejected this philosophy of fear in favour of a future where hope and ambition can flourish. The pain felt by many on the 19th has transformed into a desire to continue the journey. It is a chaotic ensemble of individuals and groups seeking to define their direction and purpose post referendum and hopefully will, in time, become a network of coordinated actions and activists. Many have joined political parties for the first time in their lives, others have committed to seeking change through local groups and organisations. A result that so easily could have killed the renewed vigour and passion of our country has instead galvanised us into action. It is a wonderful thing to behold. We may still be part of the United Kingdom but that does not mean we cannot behave as though we are already independent. We can show the world that we are different, that we do not fear change, that we embrace diversity and reject hatred, that we will elect politicians who share our ideals. We can show the world that we are not the United Kingdom, we are Scotland and we are not the same. My dad died in 1966. I was a year old so never had the chance to know the man. He enlisted in 1939 at the age of 18 like so many others in Scotland and joined the Royal Artillery. Family anecdotes had recalled he was a parachutist too and it wasn’t until I was in my teens that I realised operating big guns and jumping out of aeroplanes were strange bedfellows, unless you’re Chuck Norris or Arnold Schwarzenegger, so I dismissed it as hero worship from my siblings. It took till last year to get around to requesting his war records which threw up some surprises. He did indeed serve with the RA, at one point in Basra, that city so identified with modern warfare and the British army but he also volunteered for and served with the Raiding Support Regiment, a short lived special forces group whose contemporaries were the SAS and the Long Range Desert Group. The RSR operated in the Mediterranean and Yugoslavia, dropping behind enemy lines and offering heavy gun support to local partisans, including Tito. He was parachute trained in Palestine. He was wounded twice in action. He was docked a weeks pay for some undisclosed misdemeanour. Boys will be boys. As a kid I was immensely proud that my dad had been a soldier and fought against Hitler. I loved looking at his campaign medals kept in the drawer in my mums bedroom. I loved war movies and still do, British preferably because they do ‘War Is Hell’ better than anyone. Better Together and the UK governments assertion that we have a shared history, almost always in relation to war, can be a powerful and persuasive argument but the Commonwealth Games in Glasgow and the subsequent commemoration service at Glasgow cathedral demonstrated that times and people change, history doesn’t. All of the countries competing had been former colonies or dominions of Britain; this island forms an integral part of their own story, a story which often reflects the casual brutality of the British Empire. They were the British Empire and their contribution in both world wars is often ignored or understated. Over a million Indian soldiers volunteered to fight in the Great War – 140,000 of them fought on the Western front alongside Scots, English and Welsh troops – a fact which shames me to say I didn’t know. Indian, Australian, Gurkhas and Kiwis fought side by side at Gallipoli; I thought it was just Mel Gibson. In total over 9 million men from commonwealth countries fought alongside British soldiers in the first world war, three and a half million in the second. Their history and experience is interwoven with that of our countrymen, the hardship, death and deprivation the same. So it angers me when it is suggested that Scottish independence dishonours the memory of British war casualties while ignoring the contribution of these countries, most of whom gained sovereignty after the Second World War. Did Indian independence dishonour the dead? Or Australian? Or Jamaican? No. It is only we Scots who should feel ashamed. To suggest the we should carry a burden of guilt, that somehow history will be erased by independence is crass and reprehensible. The past is immutable and we share it not just with other nations in the UK but with the commonwealth, with France, Belgium, Holland and every other country who worked together in times of conflict. My dad survived the war, many of his comrades of every nationality didn’t. He had a shared history and experience with men of the commonwealth, men who fought the same battles. It didn’t stop those men from claiming their sovereignty and it shouldn’t stop us.